Home / Blog / Epeople – Powerful weapon in fighting dog meat trade in South Korea! Dear friends, I cannot emphasize enough how important it is to file an epeople petition. 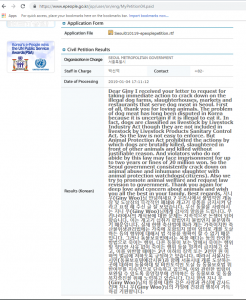 This is the official Korean government petition and they are required to provide a response. They cannot ignore it. You can find how to file the epeople petition on our campaign pages. Click HERE for the campaign pages. Then click “Click for Call to Action!” in the campaign list for campaign pages for each Korean cities. Click HERE for a “how to file” video by Susan. It’s really not difficult. Once you do it, you will find it easy and will be able to do it in one minute or less. Thank you for caring and taking action! We very much appreciate your support and perseverance in helping to end the dog and cat meat trade in Korea. Once you receive a response from the Korean government, you can respond to their satisfaction survey. Below is survey response by Francie expressing how dissatisfied she is with the Korean government’s response to her epeople petition. You can use Francie’s response or submit your own. Thank you, Francie. It fails to substantiate and evidence what direct actions your government is taking to enforce existing laws to disrupt the entrenched dog meat trade in South Korea. Your response fails to demonstrate what actions your government is taking with regard to proposing amendments to existing legislation or bringing in new legislation to address and end the dog and cat meat trade. I would also suggest that your response saying that Your Animal Protection Act having no regulation on eating dog meat needs to be aligned with your existing Article 8 of the same Act. I have also contacted the Food and Drug Safety Authority about this horrific trade as well, but as a concerned global citizen, you must see that these two issues – that is, the abusive activities of killing animals including dogs unlawfully or injuring them without justifiable reason, correlates directly with the end product of eating dog meat. I would also respectfully suggest to you and your government that as a government body you have already reached public consensus because there are laws existing now, and therefore you have had made decisions as representatives of your people. Furthermore, your response fails to formally acknowledge the existence of the illicit dog and cat meat trade within South Korea and the problems this poses to human health, animal welfare and organized crime. These unlawful practices have been widely documented by both domestic and international NGO’s and animal charities. They also have been raised as an international area of concern by many western governments with South Korea and its diplomatic missions. I, therefore, most earnestly, implore you to enact and activate your animal welfare laws to shut this horrific industry down. Be a leading light on this issue and stop the cruelty for these poor creatures.